June Gao stands proudly in front of her dining room table in Canada which is covered with English china tea cups and saucers. 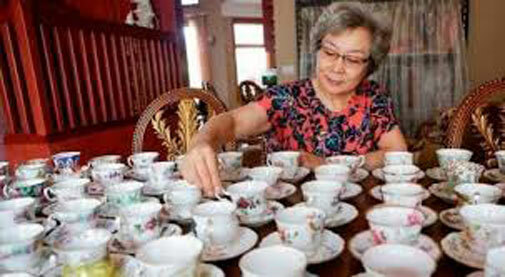 There are over one hundred delicate cups, intricately decorated and placed in rows on the table. A nearby coffee table in Gao’s spacious house is covered with only a small sample of her enormous collection of china tea ware. Gao prefers Chinese tea but has a particular love of English china tea ware. She figures that her collection which she has been building over the last 15 years includes 400 teacup sets and more than 2,000 individual pieces such as cups, saucers, plates, teapots and dinner bells. Also included are pieces of choice porcelain such as Royal Albert, Aynsley and Paragon that date back decades. She has bought most of them from antique shops, street markets and also online. She has never used them; she just collects them. Displayed in an impressive glass cabinet in her kitchen is a Royal Albert “Old Country Roses” tea set from the 1960’s. She bought it from a second hand shop in 2006 and it is her favourite. The complete iconic set includes cups, saucers, dessert plates and tea pots decorated with orange, red and purple roses. The handles and rims of the cups are trimmed with gold. She does not want to stop collecting but she has to find more space and time since, as she says, she does not have time to organize her collection. Her wish is to convert a bigger room or perhaps another house into a museum where she can display her beloved collections.